The Supreme Court order calling for a special law to deal with lynching sends a strong message about the growing phenomenon (a fact or situation that is observed to exist or happen, especially one whose cause or explanation is in question) of mob violence. From vigilante violence targeting cattle traders in the name of cow protection, it has taken a new turn. While the former was organised vigilantism (law enforcement undertaken without legal authority by a self-appointed group of people), the recent spate of killings seemingly comprises impulsive (acting or done without forethought) and unplanned acts of violence, fuelled by rumour and panic-inducing social media messaging. Last year the apex court reminded the Centre and the States they cannot remain silent while vigilantes take the law into their own hands in the name of cow protection. It asked all States to appoint nodal officers in each district to curb mobs. While the incidence of lynching and violence committed by self-styled gau rakshaks appear to have reduced since then, the killing and attacks on those mistaken to be child-kidnappers have had a disquieting rise. The police say the circulation of videos and other messages about child-lifters through messaging apps is the main reason. 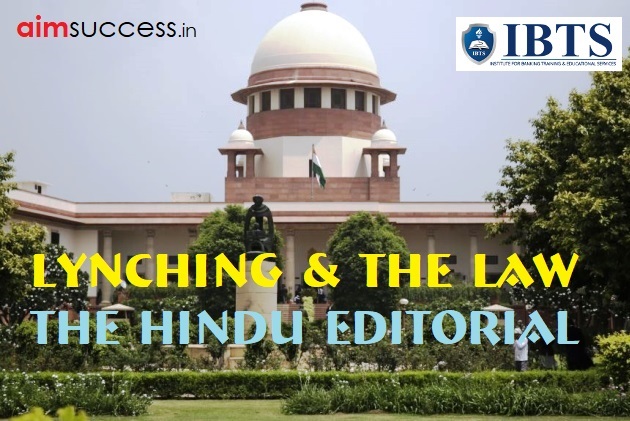 In its 45-page order, the Supreme Court has significantly located lynching and vigilante violence in a socio-political framework linked to disrespect for an inclusive social order, rising intolerance and growing polarisation(division into two sharply contrasting groups or sets of opinions or beliefs). There is an implicit (suggested though not directly expressed) indictment (a formal charge or accusation of a serious crime) of the preponderant (predominant in influence) mood of the times when it says that “hate crimes as a product of intolerance, ideological dominance and prejudice ought not to be tolerated”.